Review Nokia's X6 smartphone is more than just another touch screen smartphone in an overcrowded market. In its 32GB form, this well-spec'd music phone will only be available with Nokia's Comes With Music package. It'll be hard to avoid, and is likely to benefit from aggressive subsidies. Comes With Music is basically a free download subscription service, but this 'universal jukebox' allows you to keep the music you've downloaded. The cost of a year's subscription is bundled with the phone, so it appears to be free. 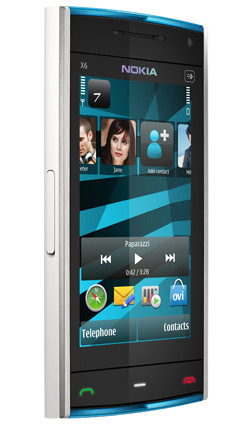 If after a year, you choose another CWM Nokia phone, it rolls over, and continues to be free. Either way, the music doesn't disappear, as it does with Rhapsody or a Spotify subscription. The only restriction is that it plays on one nominated PC and one nominated CWM phone. It's a great sounding concept, but the public has been unimpressed so far. So the X-series represents the company's best and possibly last hope that the CWM concept will finally catch the interest of the masses. Is the X6, and the revamped CWM enough to do it? The X6 runs Series 60 Fifth Edition, Nokia's stop-gap touch UI, and there are no surprises if you're familiar with the 5800 or N97 handsets. 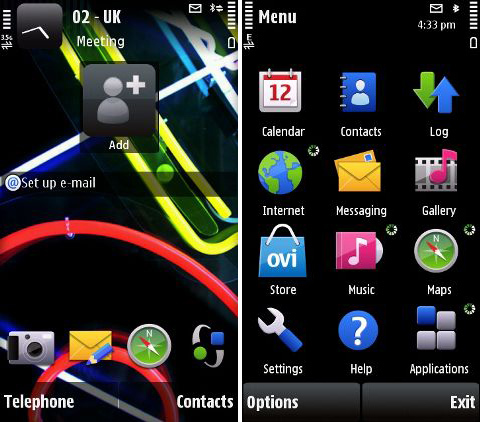 Nokia opted to retain familiarity for users, and API compatibility for developers – Fifth Edition is really just the old S60 in a fishtank, so the interface and interaction are unchanged. With a quality capacitive screen – replacing the resistive screens of its predecessors – the experience is a little smoother. That said, it really feels like the stopgap it is, S60 is Third Division compared to the Champions League smoothness of the Apple iPhone or Palm Pre. So little has changed since the N97 and S60 now also feels like a backwater. For example, Nokia also shunned the opportunity to tidy up the sprawling settings. There are no fewer than six activation wizards: Sett.wizard, SW update, Phone setup, My Nokia, Access. setup, Email setup and Switch, the migration app.